In December 2004, the Atlanta Braves helped extend their stretch of divisional dominance by landing ace pitcher Tim Hudson in a blockbuster trade with the Oakland Athletics — acquiring a frontline starter who would go on to win more than 100 games over the next nine seasons. And Joe Simpson was there to broadcast all of it. 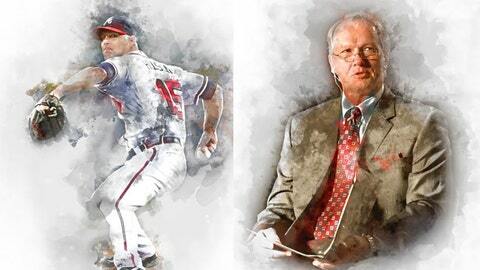 On Jan. 27, the Braves will induct Hudson and Simpson, who is entering his 27th season broadcasting Braves baseball, as the 32nd and 33rd members of the organization’s Hall of Fame. The induction will be held at a ceremony at the Coca-Cola Roxy in the Battery Atlanta. During his time in a Braves uniform, Hudson ranked 9th in wins, 17th in innings pitched and 30th in wins above replacement among qualified major-league pitchers, helping to bridge the gap from the team’s Big Three glory years to up-and-coming arms Craig Kimbrel, Julio Teheran and Alex Wood. His .611 win percentage is the third-best mark in Braves history and he ranks fifth on the organization’s leaderboard in wins, ERA, strikeouts and innings pitched. Per the team’s release, the right-hander is one of only 21 pitchers in MLB history to win at least 200 games, post 2,000 strikeouts and have a .600-or-higher career winning percentage. Simpson, who is entering his 12th season broadcasting for FOX Sports South and FOX Sports Southeast, first began covering the team in 1992 as part of Turner Sports’ broadcasting team (and fellow Braves Hall of Famers) Skip Caray, Pete Van Wieren and Don Sutton. A major-league player for 11 seasons, Simpson was named Georgia Sports Broadcaster of the Year in 1995.